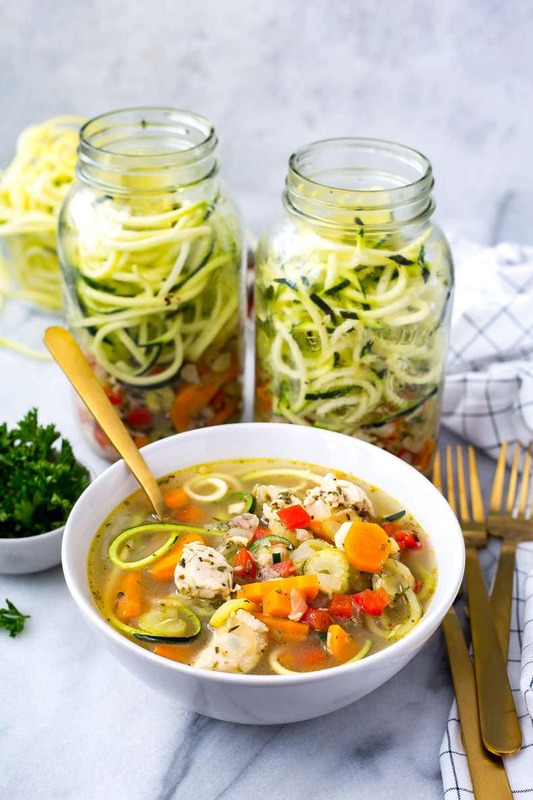 These Spiralized Zucchini Chicken Noodle Soup Jars are a perfect low-carb meal prep idea you can take for lunch on-the-go. Just add boiling water, microwave and enjoy! I am constantly surprising myself at the ways in which I can pack a lunch in a mason jar. 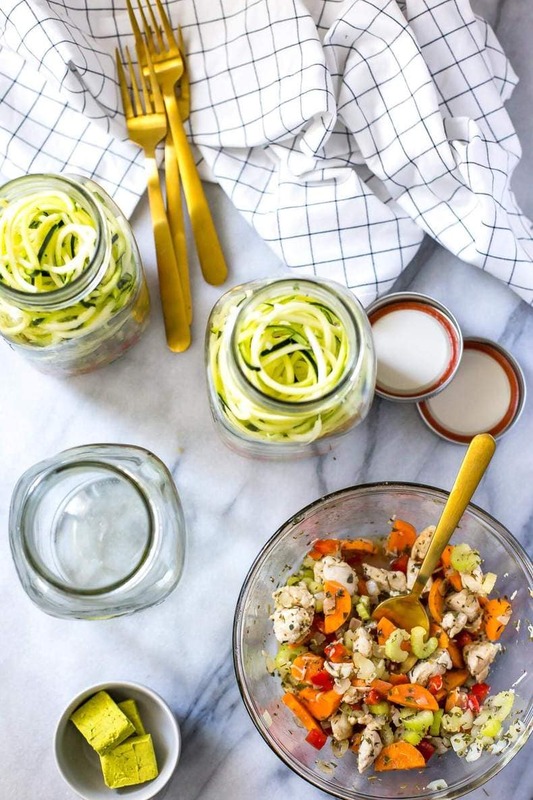 Take these Spiralized Zucchini Chicken Noodle Soup Jars for example. I mean honestly, there's no reason not to do lunch this way. 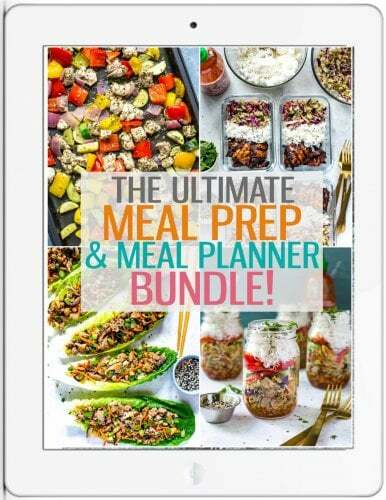 It's much more than a Pinterest fad, trust me. There's some utility to the jars, and hopefully once you watch the video and see how to do it yourself you'll see what I mean. 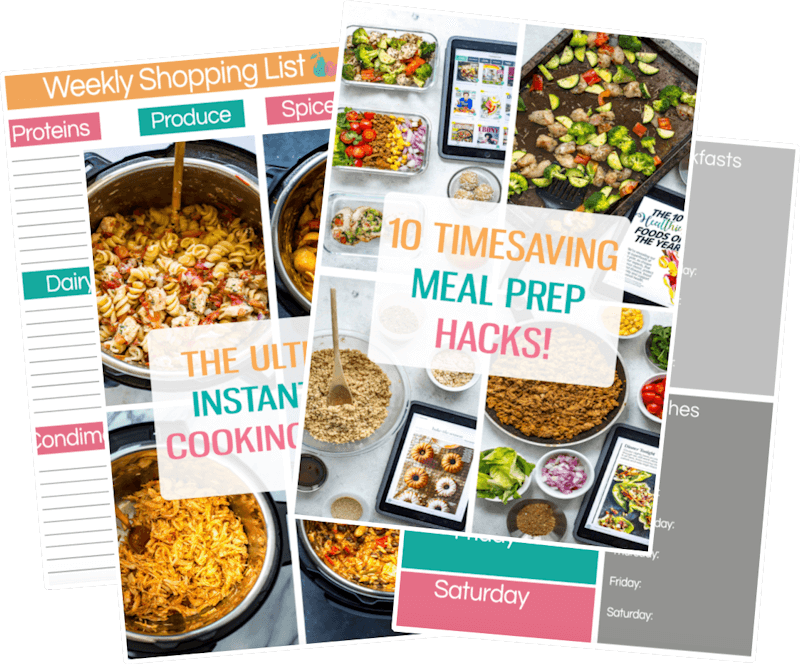 Everything is layered in just the right way that they are super easy to pack away and you've got the most delicious grab and go lunch for the work week. 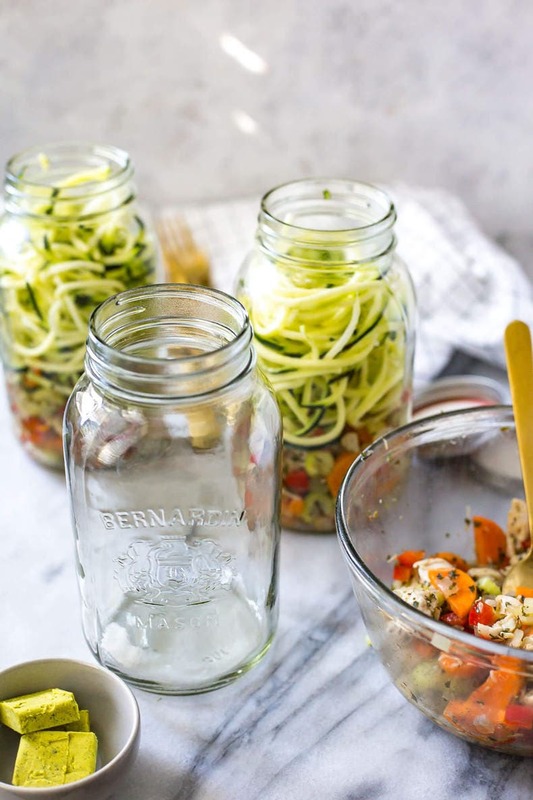 First off, there is a little bit of cooking you'll have to do with these Spiralized Zucchini Chicken Noodle Soup Jars. You can't exactly just use leftover chicken (though that's a good idea if you're in a pinch!) and call it a day. 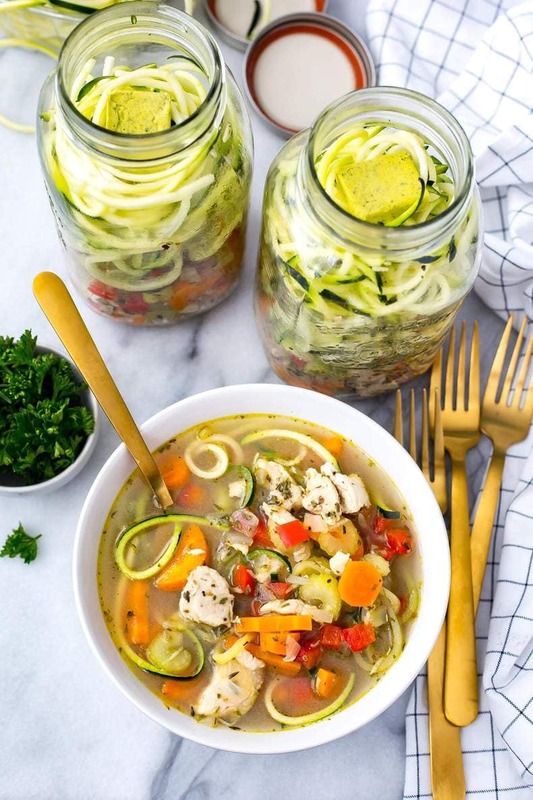 As with my Mason Jar Minestrone Soup, there's a little bit of cooking time involved beforehand, but the good news is that you can cook the chicken and veggies all in one batch, then it's just about dividing it all among the four jars and adding the spiralized zucchini. I know I've probably talked about this before, but I am such a fan of buying pre-chopped veggies at the grocery store. There are so many varieties these days and options for different cuts, from julienned veggies, diced up veg and spiralized versions of many vegetables. I buy the zucchini and sweet potato spirals from time to time to skip the pasta and noodles and create low carb versions of my favourite recipes, and let's just say these zucchini noodles were a huge hit! As if you need any more reason to add more vegetables to your diet right?? 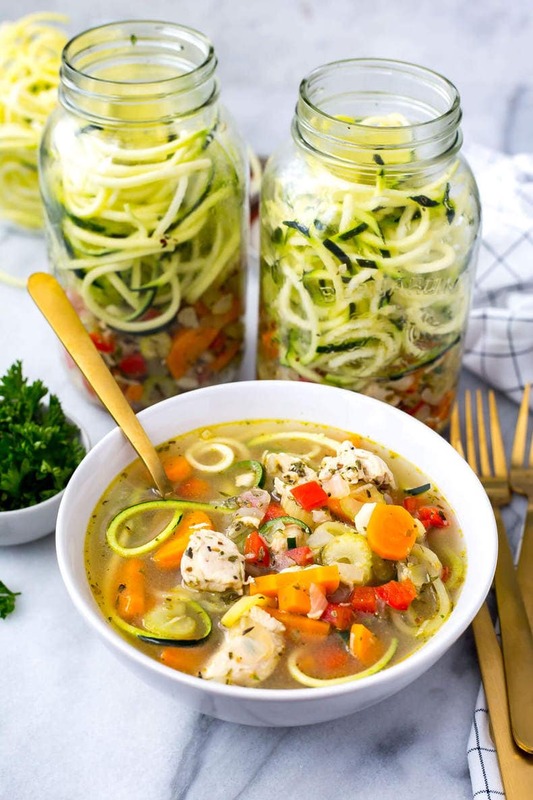 Well, these Spiralized Zucchini Chicken Noodle Soup Jars are chock full of 'em, and that's part of what makes the flavour in this soup stand up to a traditionally made chicken noodle soup. And a little bit of Italian seasoning and garlic certainly don't hurt either. Quick and easy, but a fast way to add flavour while emphasizing the “to-go” part of this recipe. I find I'm starting to eat a lower carb diet because of my health and fitness goals. I'm really trying to cut fat and burn calories during the day while boosting my metabolism, and mostly I've just been trying to work on my energy levels. I remember back in the day when I used to cook the worst things for lunch as I first started living on my own. I was so tired of the same old packed lunches that once I had the chance to stay home and study on my days off from school I basically went crazy cooking. And not cooking good food either. I still remember whipping up this red curry chicken with a pre-bottled sauce I found at the grocery store and was probably like 300 calories of sauce alone for the amount I used. OMG my former cooking style makes me cringe. I also don't know how I managed to eat that big of a lunch without having to get a ginormous coffee afterwards (spoiler alert, the coffee was probably a venti Starbucks caramel macchiatto) And I wonder why I gained so much weight my first and second years of university LOL. 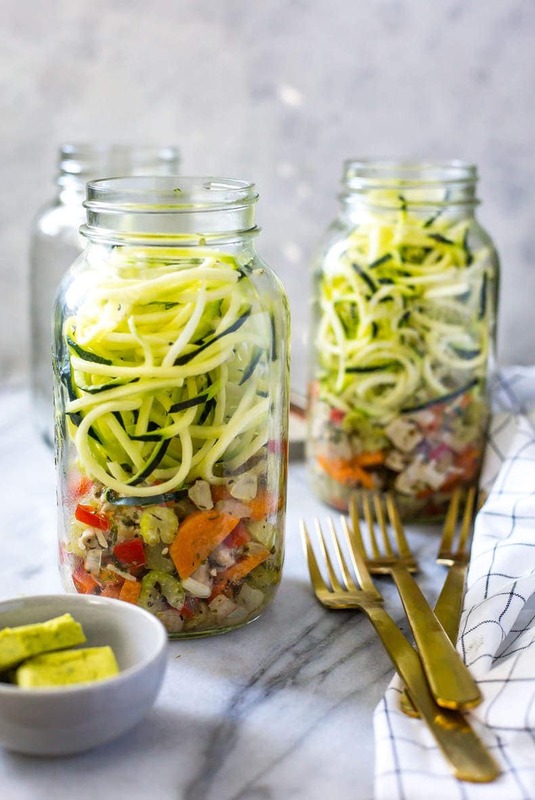 Yeah, these Spiralized Zucchini Chicken Noodle Soup Jars are definitely a lighter lunch option and super low in calories so hopefully this type of meal encourages you to stay on track with your health goals while enabling you to eat something delicious during the day. I can't promise it will be as delicious as red curry chicken, but I promise you will have more energy and know you're enjoying a more wholesome, nutritious meal that'll help you power through the rest of the workday. 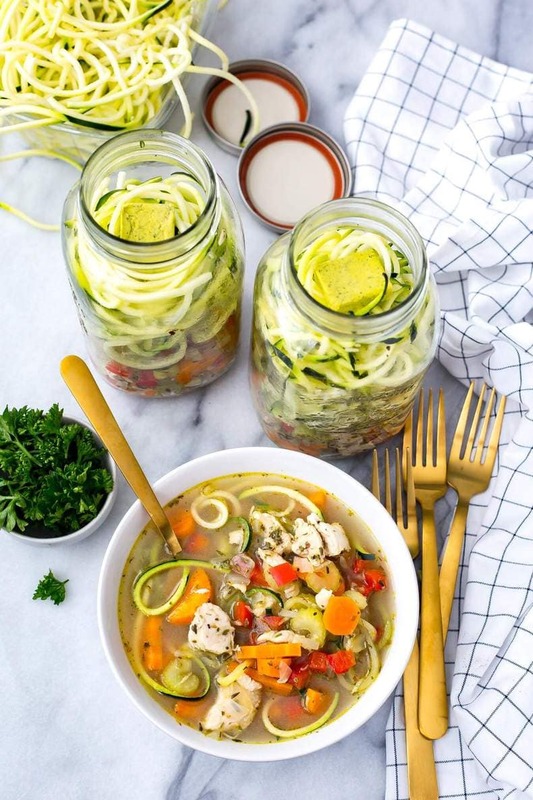 Will you be making these Spiralized Zucchini Chicken Noodle Soup Jars? 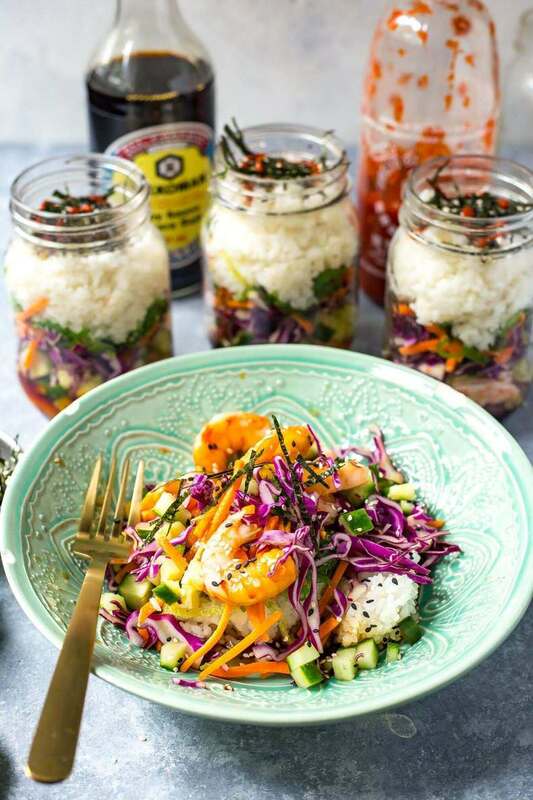 I seriously think this is my most favourite meal prep mason jar recipe yet. And I think I'm just going to keep on coming up with even more mason jar soup recipes to come. Like hello fall and winter, we're ready for ya!!! 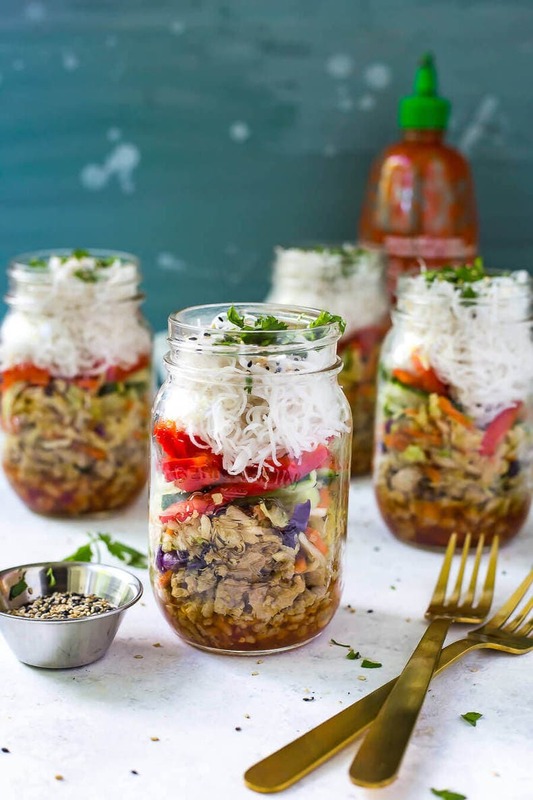 If you're looking for more mason jar lunch ideas, check out these other faves of mine below! Heat olive oil over med-high heat. Add chicken and cook for 1-2 minutes. Add garlic, onions, celery and carrots, sauteeing for 6-7 minutes until veggies are tender. Add red pepper, thyme, parsley and oregano and cook another 2 minutes, then remove from heat. Divide chicken and veggie mixture among 4 large mason jars. 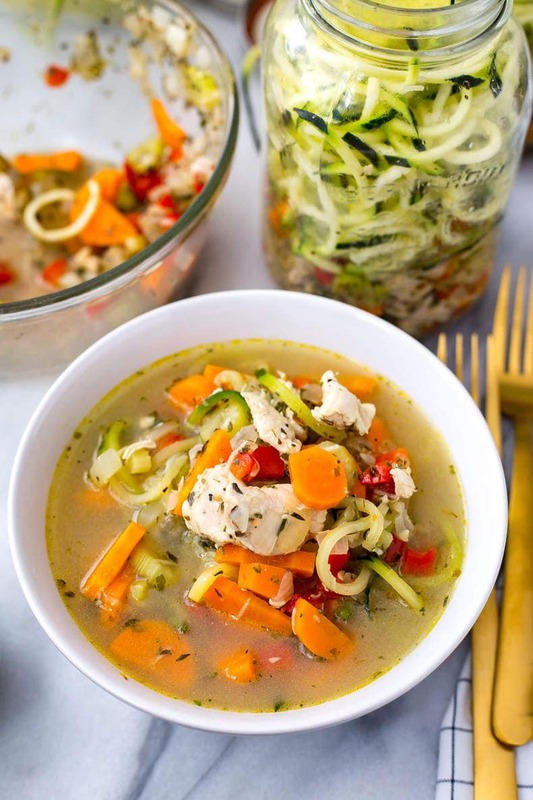 Add bouillon cube to each and top with zucchini noodles. Store in the fridge up to four days. When ready to serve, pour boiling water overtop just before completely covering zucchini noodles. Microwave for 1-2 minutes on high and remove, mixing well. Pour into a large, deep bowl, then serve and enjoy! I don’t do microwaves: can you heat in a conventional oven? Thanks so much Carol 🙂 I would not recommend heating in the oven because I don’t think the jars are safe for the oven. However, I do have a solution! 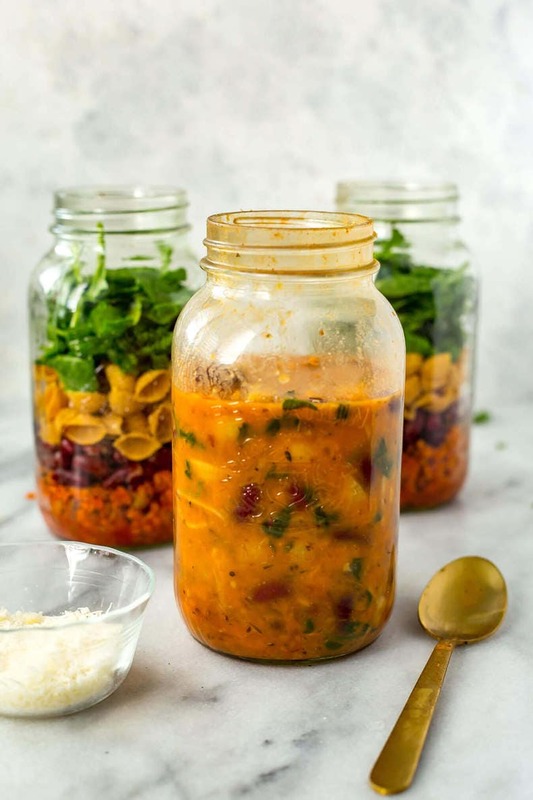 You could prep the jars ahead of time and store in the fridge then pour in the water, then dump into a medium-sized pot and heat on the stove for 4-5 min on med-high heat. I feel like that should do it! These look fantastic! What size mason jars do you use? Such a great recipe! Will definitely give this a go for university. Hi Cheryl – they are most likely natural sugars from the zucchini and the carbs also come from the veggies and perhaps the broth. Hope that helps! Looks delish! Are your jars 1qt or a pint? Can you can this to make shelf stable? Do the noodles hold? I’m sorry Libby I’m not sure what you mean…these jars need to be refrigerated and my understanding of making something shelf stable means to make it safe to keep unrefrigerated, and that’s just not possible. Let me know if you mean something else though!